I am an OCD gardener in many ways. One of these manifests itself in color-themed sections of the garden. I call the front garden the "Yellow Garden," which was my husband's choice of colors. Although not everything is technically yellow, I went out to photograph some of the sweet flowers blooming there today. This is also the garden where the ol' pine tree used to live, I posted about it last fall, you can revisit it here. Let's look at the before and after and also take a visual tour of the (mellow) yellow lands. First up is my Cotula hispida field. I loooove these little guys, my husband calls them "UFO plants." My friend Heather of Just a Girl with a Hammer quotes them as being "Silvery buns of goodness" (do I have that right, Heather?). We lost the "field" this past winter, but it is replanted and thriving. Sempervivum arachnoides blooms. Wow. Not yellow, but stunning. Here's the Arctostaphylos 'Pacific Mist' with some sedum and friends. This is looking out the kitchen window, a couple of year-old Hakonechloa macra 'Aureola' filling in nicely. Sedum oreganum in the foreground which is a native sedum, native Oxalis oregana to the left and Saxifraga (?) 'London Pride' to the right. Here are some more Hakonechloa macra around the corner. I do like these a lot; I believe there are six of them in the yellow garden. The one here in the middle had some daffodil foliage growing over it so it is a bit behind in its "yellowing." It will catch up in a few weeks. Here with some Coreopsis 'Moonbeam'. When that is in bloom, the yellow really shines. Moving down the line, here is a different cotula, this time it's Cotula sp. 'Tiffindell Gold' mixed in with sedums and 'Kent Beauty' ornamental oregano. I love how everybody intertwines here. Two different native sedums both with yellow blooms. The blooming one is Sedum spathulifolium 'Cape Blanco' and the green is Sedum oreganum, which will bloom later this spring. It's nice to have the blooming spaced out over the season. The old Arctostaphylos 'Martha Ewan' finally bit the dust. I put it out of its misery and replaced it with another 'Pacific Mist' since the first one performed so well last winter. Up above the yellow garden is a shady area. I took out an existing old rhodie and replaced it with this beauty, Rhododendron pachysanthum. Although very small still, it has put on a good bit of growth and gorgeous coppery color. Now on to the "Before and After" section. In the same area there once lived a pine. Here it is on the right. It came out last fall. BEFORE: This photo is from spring 2012, two years ago. DURING: This is from fall last year, in process of me digging it out. Again, I blogged about it here. 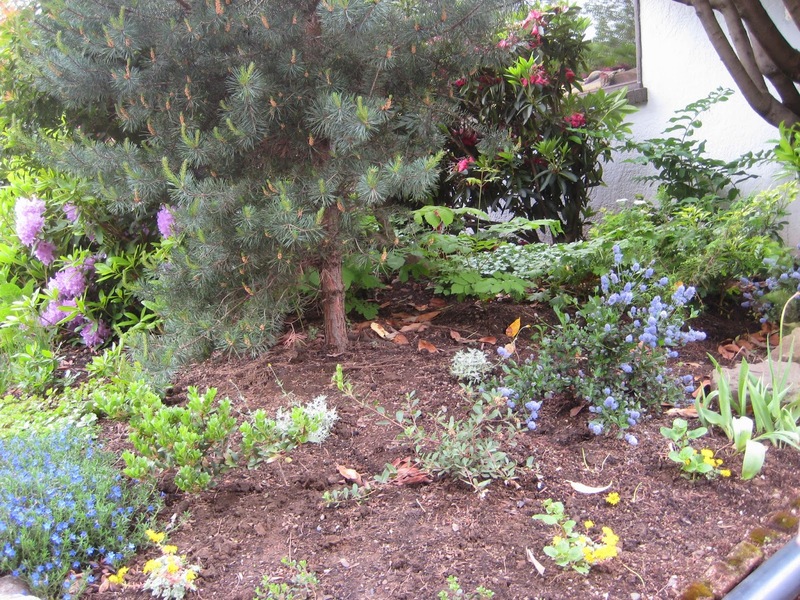 DURING: This is just after it came out last fall with a Leptospermum lanigerum 'Silver Form' in its place. Better, but still quite scraggly. AFTER: This is what it looks like today. The Aruncus dioicious has grown in, the leptospermum has put on new growth and the ceanothus has grown, too. DURING: Another shot of the area from last fall showing some yuccas that have since been replaced. AFTER: This is what it looks like today, new yuccas and everybody blooming. These are yuccas I found at Home Depot this spring. Love them! Some Arctostaphylos uva-ursi growing in the lower left there among some Sedum spathulifolium 'Cape Blanco'. Another native sedum in between the yuccas - Sedum stenopetalum var. douglasii from Xera plants. A seldom seen viewpoint, from the neighbor's driveway. There was no car in it this day so I took advantage of the photo opportunity. DURING: Again, this was last fall. AFTER: Same basic shot from the street with the pink garden (hell strip) in full view. That will be another post, another day. One color at a time for me. Looks nice with the Aruncus dioicus or Goatsbeard. A woodland native plant, so lovely. Completely deciduous, likes the edge of a woodland so sun is ok.
And although not yellow, it is near the yellow garden so I had to share the lovely rose from Heirloom Roses, 'Jude the Obscure'. A delicious fragrance and oh, those peach blossoms. I am not a rose person per se, but this one has me swooning. What colors are blooming in your garden? That's the report from the yellow garden, until next week, be mellow yellow, thank you for reading and happy gardening! The last time I was in Portland I visited Xera and picked up two of those Cotula hispidas. I love their little yellow flowers. Such a cheerful plant! Your newly planted area where you took out the pine looks great! You'd never know a tree used to be there. Aren't they the best, Alison? Thank you for your kind words, I don't think you can tell a tree was once there. The magic of plants! I soooo want to see this in person. The cotulas are adorable and the wider shots, with the mix of plantings and the limbed-up tall plants (?) is just stellar Tammy. How you mixed drought tolerant treasures with woodland wonders takes serious design talent of which you apparently abound. Great post. The before and after photos are great, your garden has so much improved, wonderful. Love the soft yellow and green colours. I also started my garden in the past with different colour sections, but through the years it has mixed up a bit by self sowing plants. I am always too lazy to pull the wrong coloured plants out. Thank you, Janneke! I think it has improved, too. I also think that over time, my colors will start to mix a little too - self-sown plants and otherwise...I sometimes don't have the heart to take out little seedlings so end up with a new experiment. Oh the yellow garden looks fabulous! Do you still miss the pine? Because to my it's like it was never there, love your plant choices! Thanks, Danger! Do not miss the pine, nor do the plants below as evidenced in the height of the Aruncus dioicus. It is now like it was never there, the magic of plants is amazing. Beautiful gardens...love the after picture. I have a white garden and a red garden and I love your yellow garden. Thank you Donna! I have a white garden too, and an "orange/reddish" garden as well. I think it's fun (and gives me a bit of boundaries when shopping) to think in terms of colors. Thanks for reading! It was great to finally meet you at the Fling! !